A favorite children’s television program that parents are probably all too familiar with is Peppa Pig. For those just learning the tales of this English character, you’ll learn that their adventures are wonderful to help spark your child’s sense of adventure, curiosity and their creativity. With Peppa Pig and her friends, your child will explore their imagination, motor skills, and social skills. Below we came up with a list of the highest rated, best quality, Peppa Pig items that we know your little one will love acting out their favorite scenes with! For this update we made sure that our top ten list had the highest rated products that the market had to offer for Peppa Pig. Peppa Pig is a wonderful way to get your child to explore their imagination and enhance their social skills. We also converted this guide to our new layout. Lights, sounds, sights, and all the fun phrases that the family of Peppa Pig says and do come to life with this fun playhouse. The house features seven rooms. Each of the rooms is featured on the television cartoon show and kids will love making the connection between the show and this playhouse. Included are also 13 accessories that have never been on the market before and can only be purchased with this set. Some of the kid’s favorite characters are included with the set as well. They will get figures Zoe Zebra, Peppa Pig, and her little brother George. It is cute, fun, and gets the kids interacting with each other. This play house features multiple characters that allow more than one child to play at a time. The size is great for a couple of kids to enjoy some time playing together. 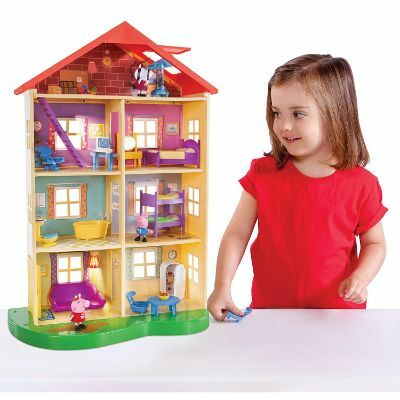 These characters and accessories will offer endless hours of playtime fun with this house. The house features light and sounds that are played from a control panel that requires batteries. These movements improve fine-motor dexterity and promote the increasing demand for better movements with the hands. There is even a muddle puddle in the front of the house for some jumping time fun. This playhouse featuring all the characters and fun sounds from the show will be a major hit at your house. The set includes Peppa Pig and Daddy Pig in their holiday attire. Also included is the family’s campervan that the seats can be removed along with a folding picnic table and grill. This is a great set to begin the adventure of holiday camping with Peppa Pig and Daddy Pig. The set includes accessories that add to the camping fun. 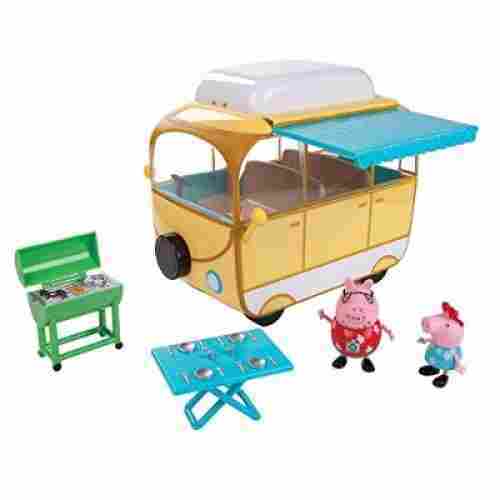 Included is both characters, Peppa and Daddy Pig dressed in holiday outfits, their family campervan with a swinging awning and removable seats, a folding table, and grill. The awning on the campervan even can be placed in an upright position to create a great shaded area for Peppa and her Dad to relax. This set is a great way to act out some of the best scenes from the TV series. The set includes Peppa and Daddy Pig and everything they need to go on holiday. The dress attire of the characters is fun and adventuress along with the campervan plus accessories. The folding awning is a nice touch. It is everything they need to start their holiday trip. Encouraging children to play with characters from their favorite TV shows is a great way to promote emotional skill development, encourages social language interactions, and develops their motor skills. The Peppa Pig Family Campervan is a fun holiday addition to the Peppa Pig characters. 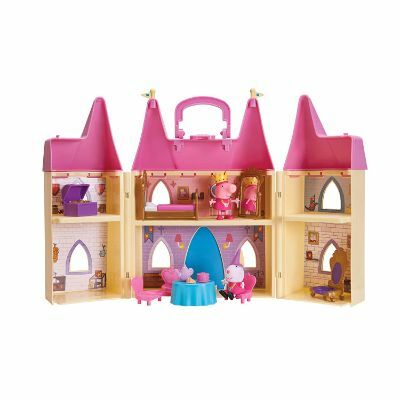 Once the kids are finished playing with the castle, it folds up and all the accessories fit into the rooms making it a royally easy set to store or carry along. There is even a carrying handle that makes taking the castle on an adventure away from home fun. Themed playsets are ideal for promoting socialization between children. It gives them a platform to engage in social behaviors. They are able to play out scenes and practice how they will handle the scenario in real life. All characters and accessories are built to scale and are best-suited for children over the age of 2 years old. 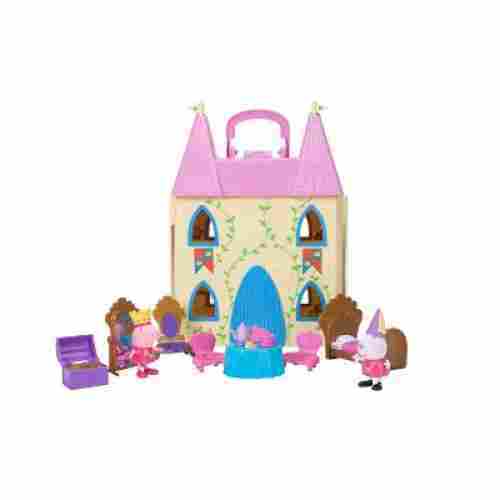 Make the next tea party your kid’s host a royally good time with this Peppa Pig-themed castle playset. Engaging in social play is ideal for setting kids up to conquer many developmental milestones achievements. The idea of tea time is one that many a little girl has dreamed up. We all remember those miniature teacup sets that we’d get as kids, complete with pretend food and pretend tea that we’d “pour” into little cups. 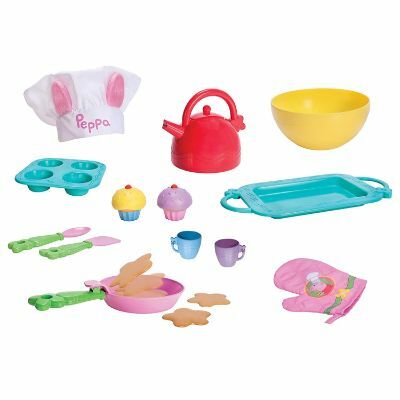 With this 11-piece set, tea time has never been more realistic for kids. It’s great for any kids over the age of two and is something that they’ll likely hold onto for years after they’ve outgrown it. The teapot actually makes sounds when you pour it over, adding to the excitement that’s not normally there when pouring a pretend teacup. Let’s face it, it’s just not as much fun when you’re forced to make your own sounds. This Peppa Pig Team Time Roleplay set follows very much the same idea, but it’s interactive! This is a neat twist on the original idea of a children’s tea time. Peppa Pig already lends itself to adorable toys, and we love that this set is just as cute as the show and features Teddy and Mr. Dinosaur as well! 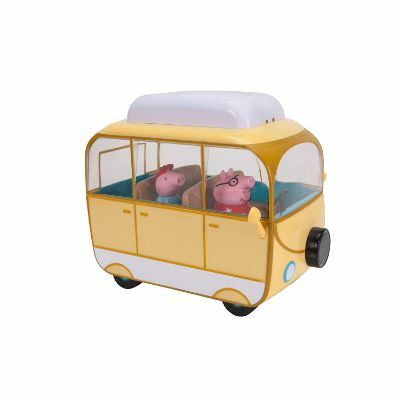 The Peppa Pig School Bus set includes a school bus with five seats, a roof that can be removed, and makes fun noises. The noises include songs from the show, fun sounds, and phrases. When the grill of the front of the school bus has pressed the sounds, songs and phrases are activated. 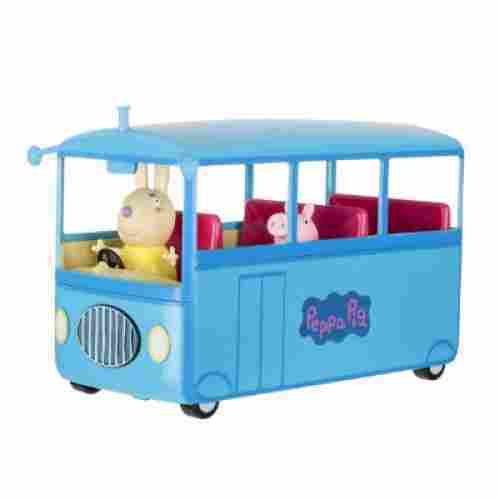 The set also includes two characters; Miss Rabbit, the school bus driver, and Peppa Pig, the student. The roof of the bus can easily be removed to place characters in and out of their school bus seats. When the grill of the bus is pressed it activates the fun songs, phrases, and sounds. School buses are so fun and children love playing with them. The Peppa Pig edition of the school bus is cute and functional. The added sounds, phrases, and songs are a nice addition to an already fun set. This gets the adventure started for preschoolers imagining there are right there with them. When kids are provided with toys of the favorite characters it boosts creative thinking skills, promotes their language skills, and encourages the development of fine motor skills. 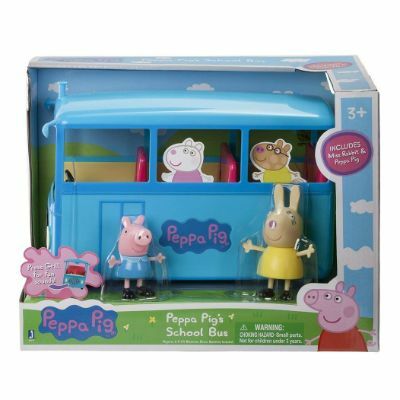 The Peppa Pig School Bus set is a great way to open the world of imaging today. 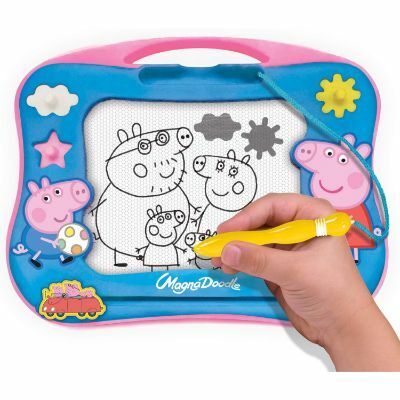 The Cra-Z-Art Peppa Pig Travel Magna Doodle features a magnetic screen that is made for drawing. It also includes stamps and easily erases when you are finished or ready to move on to another drawing. 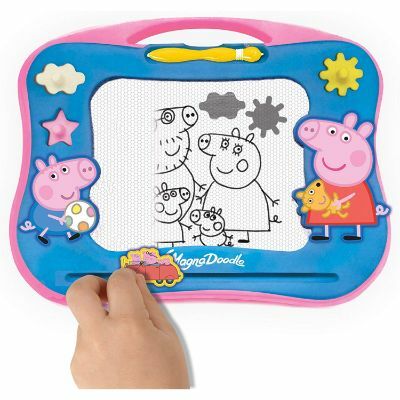 The fun magnetic pad features the characters from the show Peppa Pig and is colorfully designed on the frame of the board. 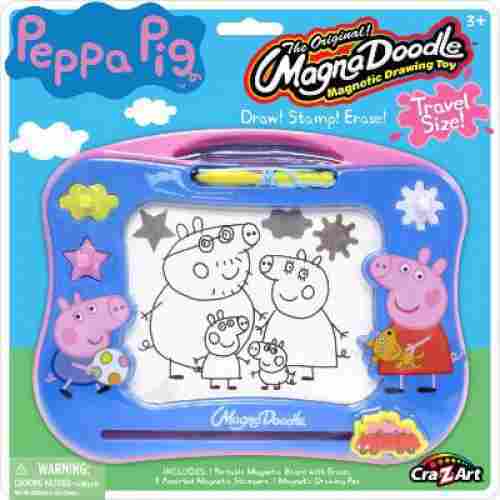 Drawing, stamping, and erasing are easy with the Cra-Z-Art Peppa Pig Travel Magna Doodle. It is a portable self-contained unit that makes drawing and stamping fun with no mess or hassles to clean up. The board features a design of the characters from Peppa Pig on the colorful outside frame. The portable unit is self-contained. This means no mess or hassle with clean up. It comes with the board, an eraser, three stampers, and one magic pen. The inside features a magnetic board that when drew or stamped on with the magnets the material inside the board stays in that shape. It is learning and exploring toy that comes with no worries. It is great for in the car or at a friend’s house. The set includes the magic magnetic board, three fun stamps, a magic pen, and eraser. Drawing is a great way to boost fine motor skill development, promote self-esteem/confidence, and develops hand-eye coordination. The Cra-Z-Art Peppa Pig Travel Magna Doodle is a fun and mess-free toy. 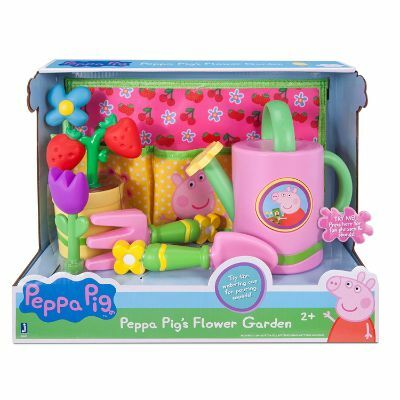 With this playset, your little one will be able to act out all of their favorite scenes with Peppa Pig and her friends. This set will spark your child’s creativity through pretend play and inspire them to think outside the box. The gang’s all here with this playset. 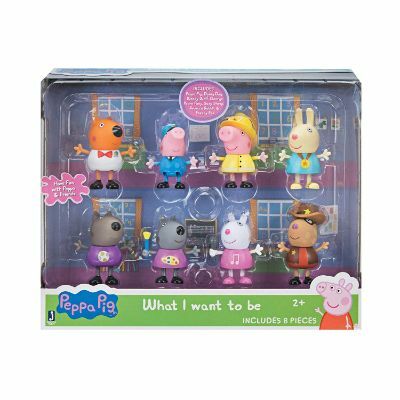 This playset features 8 figurines from the hit Peppa Pig television show. 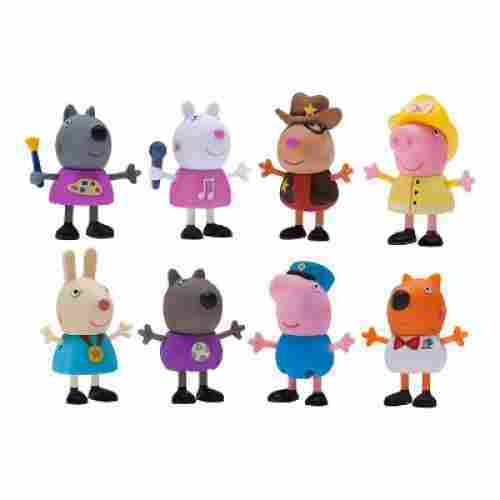 This set includes Peppa Pig, Suzy Sheep, Danny Dog, Pedro Pony, Rebecca Rabbit, Freddy Fox, Wendy Wolf, and George. Maybe they’ll even create their own Peppa Pig adventures. Whatever the case is we’re sure that your child will love this playset. It’s the perfect gift for any occasion. We love this product because it’s educational and beneficial to your child's development levels. Not only will it spark your child's creativity through pretend play, but this playset is the perfect gift for any occasion. We know your child will love acting out scenes with these 8 beloved characters from the Peppa Pig series. This set will even help enhance your child’s social skills through interactive play. This set will also help with your child’s fine motor skills as well. Do you know a little chef who is also a fan of Peppa Pig? Look no further...Peppa’s Little Kitchen will quickly become their favorite place to be. This fun little culinary delight has a few interactive features that put it over the top, including a whistling tea kettle, a sizzling frying pan, and a faucet that actually makes running water noises. The design of the Little Kitchen couldn’t be more Peppa Pig-esque with its adorable curtained window and bright pastel colors. 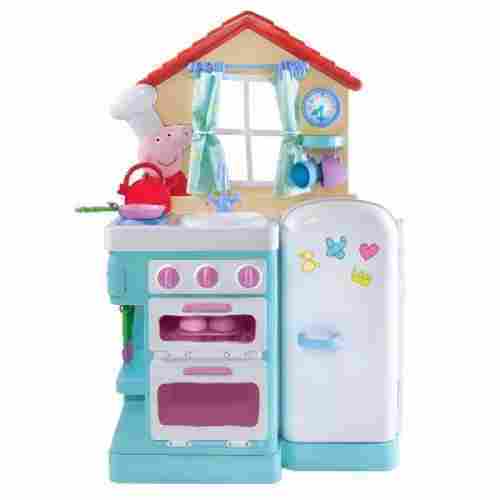 Kids will love cooking up a storm in here and coming up with their own Peppa-inspired, gourmet flair! This Little Kitchen may look small, but it has everything a little Peppa Pig-loving chef could want. With doors that work, equipment that actually makes realistic-sounding noises, and every kitchen accessory needed to be a gourmet, we can’t imagine this toy being anything short of perfect. The fridge opens and can hold small items which are great since this set comes with 18 different accessories. If your child is too young still to help out in the kitchen, a play kitchen is a great way to make them feel like they’re a little more grown-up. 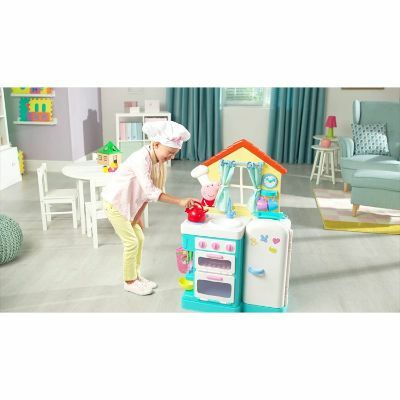 This is double the fun for Peppa Pig lovers, but overall, it’s a great quality pretend kitchen that will make kids feel like they can cook anything. This toy is an entire house of fun (literally!) for your little Peppa Pig fan. 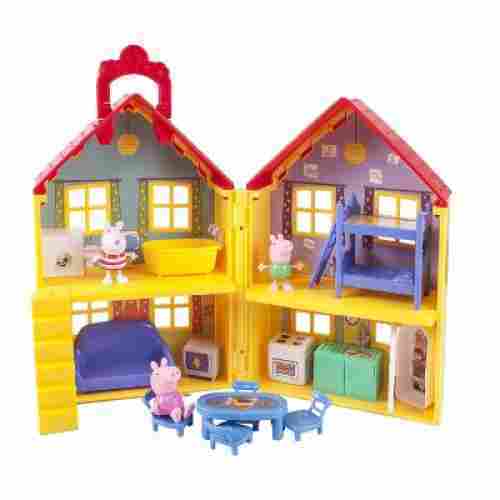 Any fans of the show are going to be through the roof (not literally) when they lay their eyes on this super cool house that features all the things Peppa Pig is known for. 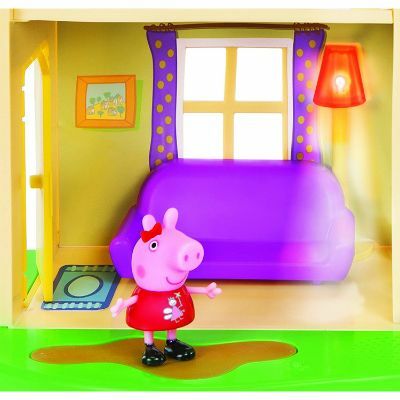 Each room comes with its own separate accessories for Peppa and her friends to use which makes it a fully interactive experience for kids. It’s a dollhouse, but one designed specifically for Peppa Pig fans! Having a home that kids can keep their favorite toys is a fun aspect to imaginative play. They can create so many different scenarios and reenact many different scenes from the show with a bit of Peppa’s life in their own home. Peppa’s house comes with her, Suzy, and George, and inside their house, they’ll have access to four different rooms. 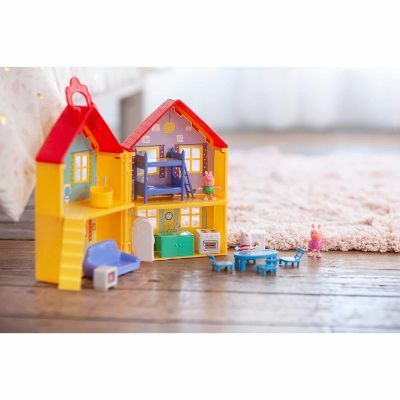 This open-up dollhouse is great for imaginative play because it takes characters kids are already familiar with and gives them access to a new environment. 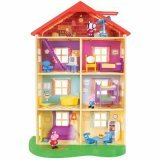 Peppa Pig’s dollhouse creates a whole new world for them that they’ll love diving into for a hours at a time. 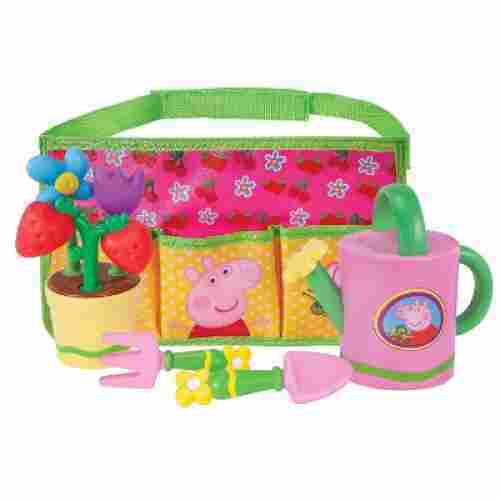 This tea time set features Peppa and George’s favorite toys in a plush doll and everything a preschooler needs to have a tea party. The set includes 11 pieces; teacups, saucers, teaspoons, cupcakes, a teapot, and both plush characters. 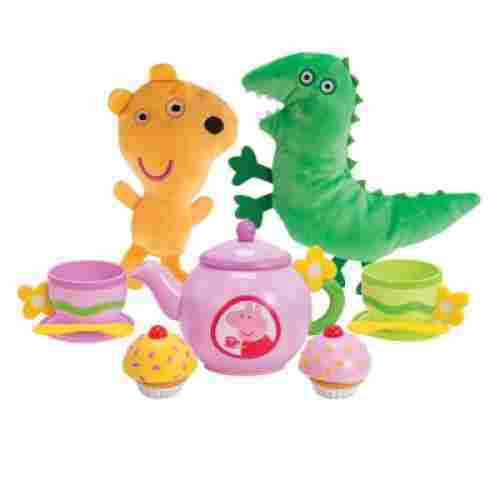 The cute plush toys add the tea time set and make it that much more fun. Each of the items including in the tea set are well-constructed and colorful. The talking teapot is a cute addition to an already great set. The teapot features phrases when the knob is pressed along with when it is tipped over. It makes a cute little pouring sound. The teapot has a knob that when pressed says fun phrases from the hit TV series. When tipped over then makes a pouring sound. 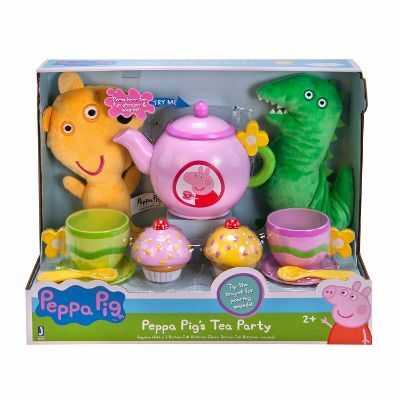 Tea Time with Peppa and George’s favorite toys could not be cuter than with this set. The set includes a plush doll figure of Teddy and Mr. Dinosaur plus two different colored teacups, saucers that match, two yellow teaspoons, two different cupcakes, and a teapot that makes sounds. The tea time set is a great way to introduce boost imaginative play, develop strong cognitive skills, and encourages fine motor skill development. This is a fun and colorful tea time set that really brings home the characters from Peppa Pig. When coming up with our top ten list above we knew that it wasn’t going to be an easy task. We looked at everything from customer reviews, how educational each toy was, safety, to quality. We wanted to make sure that each toy on our list matched every single section of our criteria. We wanted nothing but the best of the best of Peppa Pig and we made sure with extensive research that we found it. One thing we particularly paid close attention to was how educational each toy was. Parents always want to make sure that the toy their child is playing with can be beneficial to their child. With Peppa Pig each of these toys will help enhance fine motor skills, inspire their creative side through pretend play or acting out their favorite scenes along with the show, and they’ll even help improve your child’s social skills. Peppa Pig will often partake in silly adventures and has many friends with different personalities, this will also show your child the power of teamwork, and why working with a team is important. We know that you’re here simply because your child loves Peppa Pig. By now you probably even have a few episodes of the hit show memorized. Whatever the occasion is on why you’re shopping whether it’s for a birthday, holiday or simply because you know it’s something your child will be excited about, we’ve got you covered. We have the highest rated quality items that the market has to offer from this hit television show. We’re sure you will find exactly what you’re looking for. Please check out our top ten list above that we think is nothing but the best of the best of 2019. Peppa Pig and her family are a family of pigs from the Nick Jr. hit animated TV series. The family consists of a mother, father, daughter, and son. The names of all the characters of the family are simple like the mother is Mummy Pig and the father is Daddy Pig. The son in the family is George and the daughter of the family is Peppa Pig. The show also includes other characters as well. The characters are also other animals with simple names like Danny Dog and Zoe Zebra. These are all friends of the family. The show demonstrates activities like the children playing in the park, riding their bikes, and new siblings entering families. Through the show, children are able to learn how to handle these situations and how they are playing out through the characters. This is very helpful in developing strong emotional and social development skills. Playing with characters is also a way to develop strong physical skills as well. When playing, children develop their hand-eye coordination and fine motor skills. These are both important skills needed throughout life. They are used to write, drive, and even eat. When they are able to develop these skills through playtime, it gives them lots of practice unknowingly. Playing with character toys from a TV show is a great way to help children develop both physically and mentally. When you encourage children to engage in play time, you help them develop their fine motor skills. When they use their fingers and hands to complete an activity, this helps develop strong motor skills. These motor skills are used when taking off their socks or tying their shoes, for example. It is very important to develop strong fine-motor skills through play time. Other activities that help develop strong fine-motor skills are finger painting, playing with characters and moving them along or in out of an object, or coloring. These are all great activities that practice those skills while children are also having some fun. When they are able to learn and have fun they are more engaged and the experience will benefit them more. q: What is Peppa Pig? Peppa Pig is an animated British TV series featured on the Nick Jr., network and mainly geared to preschoolers. The show features a pig named Peppa, and her family, along with other animal friends. q: Who created Peppa Pig? Peppa Pig was created by Astley Baker Davies. The show made its first appearance on May 31, 2014, and was not accepted by the public. It was not a hit until it made its second appearance in 2015. The TV series is played all over the world. q: Where can I find the toys on the 10 Best Peppa Pig Toys list? The Peppa Pig toys that are listed on the 10 Best Peppa Pig Toys can be found on Amazon. Each of the items has a link directly to Amazon below the picture. When you click on the link it takes you directly to Amazon where you can purchase the item from them. q: Are all the toys on the list of the 10 Best Peppa Pig Toys safe for my 3-year-old? The toys on the list of 10 Best Peppa Pig Toys are all safe for a 3-year-old. Some of the items do feature smaller pieces, so it is recommended that you check the manufacturer's safety rating as well. It is always a good idea to double check a toy with small parts before giving it to a child. q: Why is playing with characters from TV series so fun for kids? It is fun for kids to play with characters from TV series because it helps inspire their imaginations. When their imaginations are inspired, they are learning and understanding social interactions. This often brings children to a happy place. q: How much screen time is too much screen time for a 2-year-old? It is recommended that children 2 years of age or older have no more than one hour of screen time a day. This includes both times on a tablet or smart device and watching TV. Keeping screen time limited helps develop healthy habits for young children.